For the meringue, preheat the oven to 150˚C. Line a large baking sheet with baking paper and non-stick cooking spray. Place the egg whites and salt in the bowl of a stand mixer, and beat on high to soft peak stage. Add the castor sugar gradually. Once all of the castor sugar has been incorporated and the meringue is glossy, fold through the cornflour and white wine vinegar. Add half of the sesame seeds and fold through lightly. Spread the meringue onto the baking sheet to fill 2 discs of 20cm diameter and scatter over the remaining sesame seeds. Lower the heat to 110˚C and bake, 1 hour 20 minutes. Switch off the oven and leave to cool in the oven. To make the poached pears, combine the demerara sugar, water, port and cinnamon quills in a deep saucepan. Bring to a boil. Once the sugar is dissolved, add the pears to the liquid and simmer over medium heat, about 25 – 30 minutes or until the pears are tender. Remove the pears with a slotted spoon. Over high heat, reduce the liquid until thick and syrupy, about 10 minutes. Pour the syrup over the pears and leave to cool. For the chocolate sauce, preheat the oven to 130˚C. Spread the white chocolate onto a non-stick baking sheet. Roast in the oven, 30 – 35 minutes, stirring at 10-minute intervals. Tip the caramelised chocolate into a saucepan and add the 250ml (1 cup) cream. Bring to a boil and simmer, 12 minutes, until the chocolate pieces are dissolved. Add the vanilla extract and set aside to cool. For the vanilla cream, in a clean bowl, whisk the 500ml (2 cups) cream to soft peak stage. Fold through the Greek yoghurt and vanilla extract. To assemble the Pavlova, place a meringue disc on a cake stand. Spread with a layer of the whipped vanilla cream. Drizzle over a third of the roasted white chocolate sauce. Repeat these steps with the second meringue disc and cover with the remaining cream. 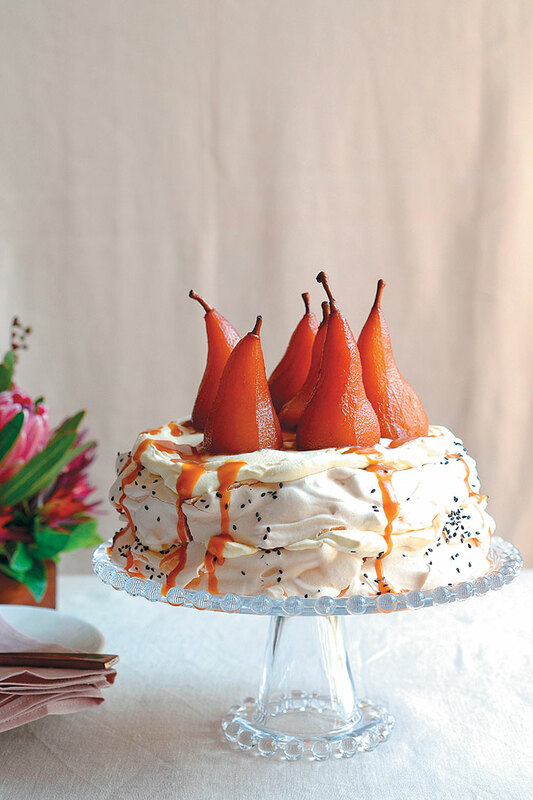 Place the port-poached pears on top and drizzle with chocolate sauce. Serve immediately.